The Grand Master’s Chance to Advance Class for 2014 provided a superior forum to pass 31 Entered Apprentices to Fellow Crafts and 34 Fellow Crafts to Master Masons. The all-day event was held at the Wichita Scottish Rite Center on Saturday, August 9, 2014 with the full contingent of Grand Lodge officers present. Degree work was exemplified by the corp of Grand Lecturers who put on their best work. The Grand Master has sanctioned a state-wide Chance to Advance (C2A) Class for August 9, 2014 at the Wichita Scottish Rite Center. C2A is a way to advance Entered Apprentices and Fellow Crafts to Master Masons. All degree work and lectures will be given, primarily by the experts in degree conferral, our Grand Lecturers. Each person attending must preregister; there will be no onsite registration the day of the event. Print and bring ticket generated when registration is complete. Reg closes 8-1-14. All attendees must register for a proper headcount. Click to go to the EVENT REGISTRATION SITE Hurry. August 1st is coming up fast. 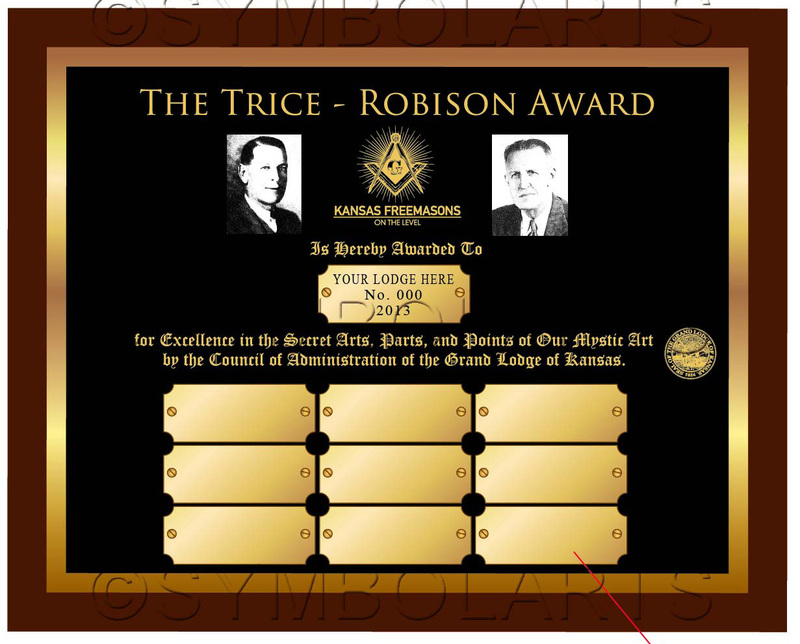 Legendary Mason and well-published author Brother Robert G. Davis 33º G. C. of Guthrie, Oklahoma will be the first guest speaker in Kansas Lodge of Research’s new Masonic Legends: Lunch n’ Lecture Series. The luncheon will be held on August 30, 2014 starting at 11:30 a.m. at The Celtic Fox in Topeka, just two blocks from the Grand Lodge Building. This event is the same day as the Allied Masonic Degrees and the Mount Zion #266 meeting, both of which are being held in the Grand Lodge building. Registration for lunch is required but can be done online. For more information, see the KLOR page. To register online, see our Registration Page. The News Program, CBS This Morning aired about a 10 minute story on Freemasonry in America. The Story, done by Mo Rocha, is well put together and features S. Brent Morris an accomplished and noted Mason as well as a friend to the Grand Lodge of Kansas. To view the story, click the link below. Area 5 Proficiency Contest Unveiled on Sept 7th. One of the three lanes of the updated Vision 2020 plan set forth at the 157th Annual Communication is excellence is esoteric work. In the 2012-2013 Grand Lodge year, only 13 proficiency cards were issued for the entire State of Kansas. The Area 5 Proficiency Contest was begun to promote interest in obtaining proficiency cards in the Area 5 Lodges, and to add a bit of friendly competition between Lodges in the process. 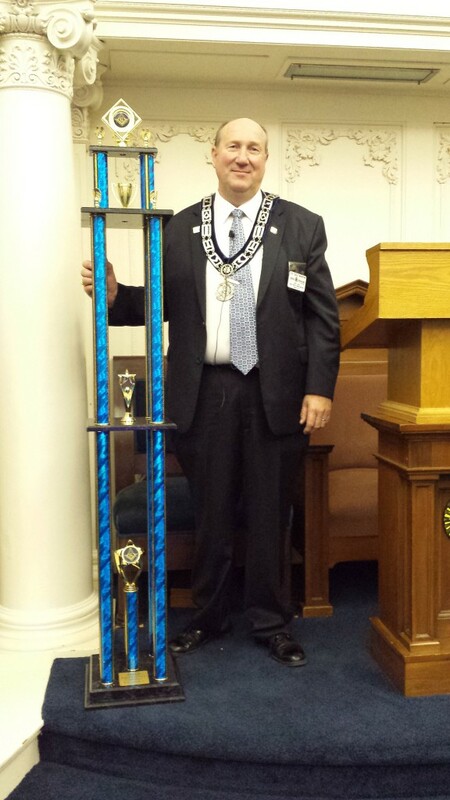 The prize is a six foot tall championship trophy to commemorate the winning Lodge’s achievement. Proficiencies earned from the close of the 157th Annual Communication on March 16, 2013 to the opening of the 158th Annual Communication on March 21st, 2014 are eligible. Entry forms are due to the Area Deputy Grand Master by the opening gavel of the 158th Annual Communication, either by electronic means or in person. Copies of all proficiency cards earned should accompany entry forms. The total point score for the Lodge shall be the sum of the point values for all proficiency cards earned by Brothers who are on your official roster as a member of your Lodge. Brothers who hold membership in more than one Lodge, or Plural membership, may only have contest points in one Lodge. A Lodge’s total score will be divided by the number of members of that Lodge, as published in the Advanced Report of the 158th Annual Communication (this is to give large and small Lodges a more equal opportunity to participate). The Lodge with the highest quotient will be deemed the winner. In the event of a tie, the winner will be decided by a coin toss. The Championship Trophy will be awarded at the 158th Annual Communication. Fourty Masons gathered in Topeka today to take delivery of the new Kansas Masonic Education course from famed Masonic author S. Brent Morris, PhD, 33. The “Train-the-Trainer” session is based in the widely available new Special Kansas Edition of The Complete Idiot’s Guide to Freemasonry. These trainers will soon be scheduling regional gatherings to present up-to-date, exciting material that should spark much interest in learning our Masonic heritage and entice the uninitiated to join us. Contact R:. W:. Daren Kellerman for more information and check the Grand Master’s calendar for course offerings. To see more pictures and commentary, follow us on Facebook. For the last two years the Grand Lodge, with no small effort from Assistant Grand Secretary Joesphe Stiles, has endeavored to have an official Kansas Mason License Plate created by the State of Kansas. The Kansas Legislature passed the bill that allows for the plate and kicks off a fundraising endeavor. In the works for a while, almost 350 Kansas Masons have committed to purchasing a plate, the Kansas Department of Revenue requires a commitment of the purchase of at least 500 plates before they will begin printing. Grand Senior Warden Daren Kellerman has stated, “This program can provide a large number of moving billboards for Kansas Masonry. We just need enough Brother Masons to sign up.” Once 500 Masons have committed to the program, printing can begin and the plates should be available shortly. Unlike most vanity or other Affiliate Plates, the Kansas Mason Plates are not expensive. Each plate has an initial onetime fee of $45.50 to the State of Kansas and a $25 annual fee to the Grand Lodge of Kansas in addition to your local taxes and fees. This money, as directed by statute, will be split between the Grand Lodge Library and Kansas Freemasons Charities Inc. “Many of us will spend $200 on a nice Masonic wrist watch or ring. Why not spend $25 and help out our great charity and library?” stated Stiles. If you want to purchase a plate or plates, send an email to plates@kansasmason.org. Provide your name, member number, Home Lodge Name and the number of plates you are willing to purchase. Throughout several periods in our great history, many Grand Masters have taken efforts to protect our great ritual. As early as 1876 M:. W:. Silas Sheldon expressed his concern of losing our proficiency because of the large number of Lodges that were being established across the state. His concern was that the fraternity was growing so fast in western Kansas that the craft would default on the ritual in favor of granting the Warrant for the Lodge. As a result, he denied many petitions just to ensure that ritual would stay in the forefront of Masons in Kansas. We see this concern again in 1948 when M:. W:. Glenn Robison served as Grand Master. His concern was not due to the springing up of new lodges, but rather the massive influx of new Petitions of the Mysteries coming from all our boys who had returned home from the war. The other problem facing Robison was that there were only a handful of aging brothers across the state who were respected enough to be deemed “qualified” to educate new Lecturers. His recourse to that action was to establish the first Ritualistic Committee which was chaired by his Masonic Father, M:. W:. Jack Trice. 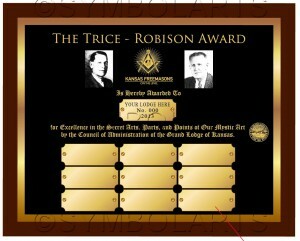 This Committee gave birth to the system as we understand it today and caused the Grand Lodge Leadership in the 1970’s to establish the Trice Robison Award. In examining our current state, it is evident that our problems are not in large numbers, rather the rapid reduction of the same and apathy about it. A part our refreshed Strategic Plan is to renew Excellence in the Esoteric Work. This goal, in particular, caused us to examine our current state and look at ways to renew our enthusiasm about our great and sacred ritual. Reviving the Trice Robinson Award seems to be an excellent way to do just that. The revised version of this award causes a greater team effort and focuses not only on Ritual but Leadership and Education as well. With the final touches being placed on this Award, we intend to launch it at the Leadership Academy on November 2nd. 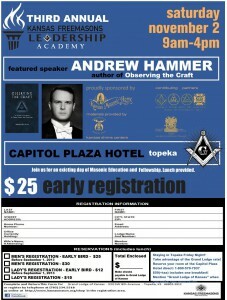 For more information see our Grand Lodge Website, www.kansasmason.org, or look for the flyer soon to come in the mail. The form is available on the Downloads page of the Members’ Area. SAVE THE DATE and SAVE $$ by registering for the Third Annual Leadership Academy now! Simply download and print the form below and mail your reservation to Grand Lodge to hold your place for what promises to be the best Academy yet. 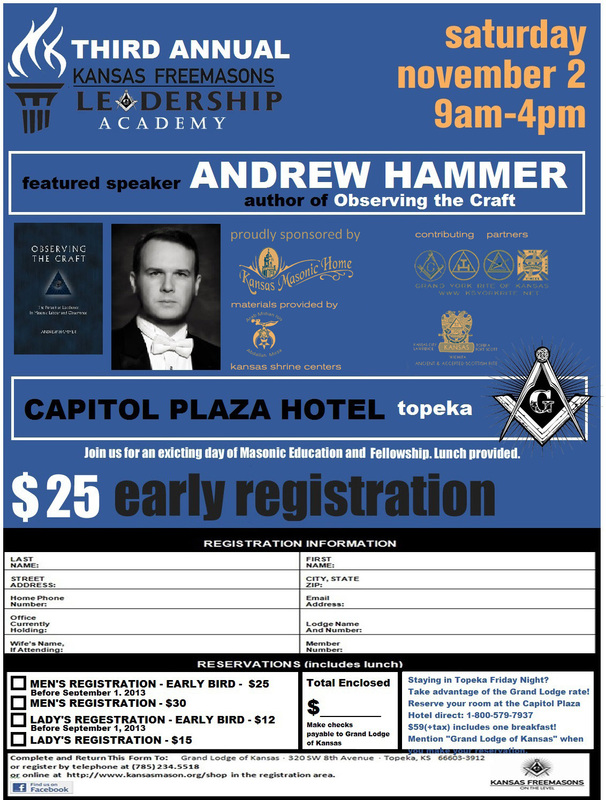 The 2013 Leadership Academy will be held on Saturday, November 2 at the Capital Plaza Hotel and will feature keynote speaker Andrew Hammer, PM of Alexandria-Washington Lodge No. 22 in Alexandria, Virginia. The author of the wildly popular “Observing the Craft,” W:. Bro. 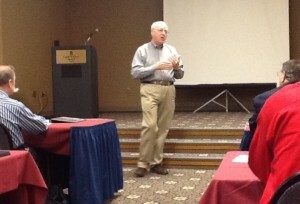 Hammer will speak on contemporary America Freemasonry and the challenges and opportunities we face. Combined with our other breakouts, we will also have previews of the new Masonic Education course that will be offered state-wide starting in 2014! This year, plan on attending the Kansas Masonic Foundation’s charity auction to be held Friday night at the Capital Plaza Hotel, as well. More details on that event will follow. Rooms may be reserved at the Capitol Plaza Hotel at special Grand Lodge rate of $59 9+tax) which includes one breakfast. Mention “Grand Lodge of Kansas” to receive your special rate when you make your reservation. Don’t miss this year’s Leadership Academy! Tentative Course Outline available here.